Let me preface this statement by saying that I will never forget what I was doing on September 11th 2001 when I got word about the falling of the Twin Towers. I was¬†in the midst of my Junior year at Hampton University. On this particular morning, I was driving to a friend’s house.¬† Ironically, my friend lived right next to Langley Air Force base in Hampton, Va (well as close as you can actually get to the base).¬† We watched the coverage non-stop and sat there in disbelief. Ok, so maybe he could have used another tragedy in the history of our country.¬† Maybe it’s still “too soon” to talk about that day. I get that. But the reaction that a lot of people are having make it seem as if Wade made a comment disrespecting the families whose lives were changed that day. All the guy is saying is that the media will act as if a life changing tragedy just occurred. Actually, all he is saying is the media will overreact if they lose a few games just like they are overreacting now about his meaningless comments. ¬† Again, let me make it clear, I totally understand why Sept.11th is a sensitive topic. And I would totally agree with those people who have a problem with Wade’s comments if I felt he had some ill motives behind them. So instead of commending the man for the work he has done for the community, we are spending time ripping the man for comments that are being taken out of context. 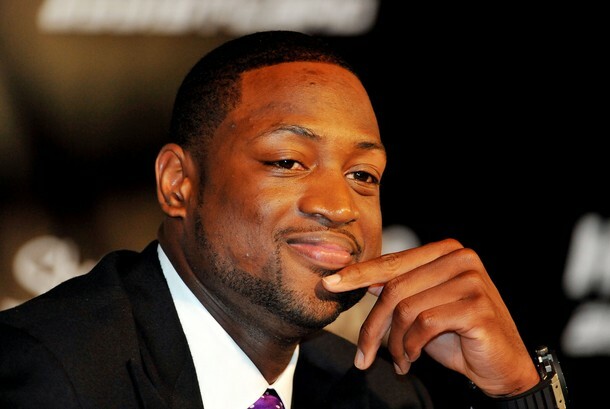 ¬† Look, let‚Äôs be real, Wade knew that the move he made with LeBron James and Chris Bosh would keep “The Big Three” in the spotlight. The “Three Amigos” understand that the entire NBA is coming for them despite the L.A. Lakers actually being the defending champions. But I doubt he knew they were signing up for this type of backlash. ¬† What’s funny is I think these type of attacks from the media will only make the “Miami Thrice” work harder to accomplish what they set out to do. Nevertheless, we can already tell that the stuff coming out of South Beach will make an episode of Curb Your Enthusiasm look mundane. So I guess it’s safe to say the 2010-11 NBA season will be pretty, pretty, pretty good. Dude, yeah, nobody is saying that he intended to offend or even thought out the comments. He shouldn’t be made to look like a real jerk or anything. But he shouldn’t have used ANY HUMAN TRAGEDY to speak of a 2 or 3 game slump – let alone a completely terrible season. It’s like when Keven Garnett compared his game mentality to a bunch of serious military weapons years back and people called him out on it. Some are offended by it – and that’s all that matters – whether it’s to protect their feelings, be respectful, or just avoid putting yourself in this type of situation – it shouldn’t happen. He could have said ‘we may lose consecutive games, or have a long losnig streak and people might freak out, but it’s not going to be that horrible. We have talent and will do well’. – see, same point, no human tragedy. That’s all – the guy made a mistake and he shouldn’t be judged for it – just apologize, and maybe point out that – we all have to be a bit more careful about using extreme metaphors to express ourselves’. Nobody should question his character as he’s proven it well – judge the statement – and notice that it’s a societal thing that we’re all capable of and should make efforts to curb. Same goes for using the word ‘retarded’ casually or referring to the holocaust to make a point…etc. Call me ‘PC’ if you want, but it’s better to just avoid offending others – not because you think it’s offensive – but because they might – if you think that’s bs – at least avoid yourself the trouble right? Mr Jervey – you did it too – you said ‘these types of attacks from the media’ – how did they ‘attack’ him? They pointed out that what he said could be taken offensively – that’s not attacking. I’m not saying it’s as bad as talking 9/11 casually – but it points out how we casually use language that means serious violent stuff a bit too much. Maybe there’s a media article that went overboard and suggested or said that Wade is a bad person because of it (I doubt it) so if that’s the case, they’re wrong. But saying he spoke in a dumb way that was potentially insensitive is no attack. Stop saying it was taken out of context. Does anyone understand what that means? He was saying that if they went on a skid that people would freak out like it was the end of the world. He couldn’t possibly be any clearer here. It was in terribly bad taste for him to say that, but it made me more upset that he said that we took it out of context. By saying we took it out of context, he is not really admitting that he made a mistake which is why I am frustrated with him. Athletes and politicians are always saying that things are taken out of context and 99% of the time, they are just not owning the fact that they said something stupid. It was certainly blown out of proportion, but it wasn’t taken out of context. D-Wade seems like one of the good guys to me especially considering all of his philanthropy, but it doesn’t absolve him of admitting when he said something stupid. And also if you don’t want to be judged by what you say, then try to stay out of the media a little more. See Derek Jeter. The statement was ignorant. He didn’t know any better. His apology should have been short and sweet, one sentence. I APOLOGIZE TO ALL THOSE OFFENDED BY MY POOR CHOICE OF WORDS AND I SHOULD HAVE NEVER REFERENCED A NATIONAL TRAGEDY WHILE CRITICIZING THE MEDIA.